So you’ve decided to get a purebred German Shepherd dog. What an exciting time! You’re about to create a special bond and friendship that will change your life for the better. Like anything worthwhile, when you own a GSD, you’re going to reap the benefits of what you put into it. The more time, attention and training you show your pet, the better behaved they’re going to be. So let’s take a look at where to start. As a rule, try to shoot for at least 22% protein in its diet. That means buying high-quality dog food, instead of something that’s cheap or on sale. In the case of a lot of bargain brand dog foods, corn syrup gets added as a filler. Your new best friend deserves better than that. You will also want to keep the fat content to around 5-8%. 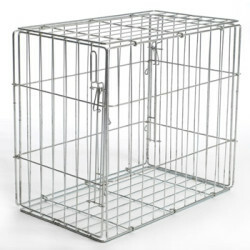 This will keep them healthy and their coat looking amazing. 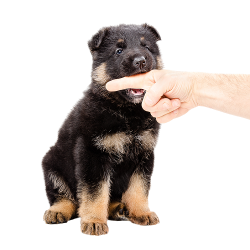 As puppies, your GSD should eat 3-4 smaller meals a day to give them enough fuel to keep going. When they grow to 6 months and older, you can cut that back to 2. How much should you walk or exercise your GSD? As much as possible! This can mean anything from a walk, a trip to the park, or a good romp in the backyard. 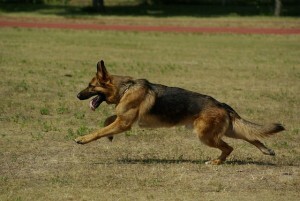 Your German Shepherd is a high-energy dog. They want to be active and don’t like to be bored. And the more activity they get, the better behaved they will be. If your GSD is inactive, they’re more likely to act out. Signs that your puppy isn’t getting out often enough may include them urinating in the house, or eating your furniture or other belongings. Owning a GSD is a great excuse for YOU to become more active. They get you outside and into the fresh air. Joggers love going for a run in the morning or after work with their loyal companion right next to them. Chances are good you chose this breed of dog because you heard they are great with kids. And that is 100% correct. GSD owners love to see the bond that their dog develops with their children. 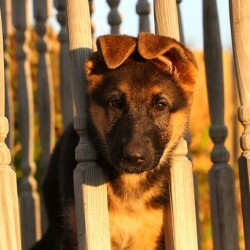 The puppy will forge a deep closeness with everyone in their family and become very protective of those they love. Of course, the kids will need a bit of training. They need to know how to “play nicely” with the new puppy. 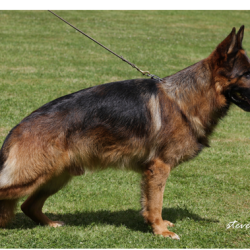 It’s up to you to show the child how they can do their part to ensure your GSD is well taken care of as they both mature together. Your journey always starts with partnering with the right breeder, who can guarantee your dog’s strong health and lineage. Hello to all, the contents present at this web page are really awesome for people experience, well, keep up the nice work fellows. I am really impressed with your writing skills and also with the layout on your blog. Is this a paid theme or did you modify it yourself? Anyway keep up the excellent quality writing, it’s rare to see a great blog like this one today. Hi, I do think this is an excellent site. I stumbledupon it 😉 I will come back once again since I book marked it. Money and freedom is the greatest way to change, may you be rich and continue to help others.